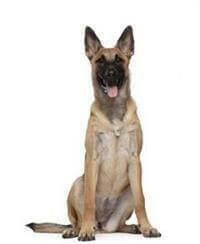 The Belgian Shepherd Dog is unique in the world of dogs as it is the only breed to have four separate varieties. Structurally they are all the same and differ only in coat and colour. There is the long coated black - the Groenendael, the long coated other than black - the Tervueren, the short coated - the Malinois and the rough coated - the Laekenois. First recognised as a breed in 1891, the Belgian Shepherd Dog was originally bred to herd sheep and is a medium-sized dog that is accustomed to the open-air life and built to resist the cold Belgian climate. The Belgian Shepherd Dog will usually live for 12 years, but fed the right nutrition and given plenty of loving attention can live up to 15 years of age. A healthy female in prime condition should be about 25kg and 56cm tall, while the male dog should be 35kg and 66cm tall. By the harmony of its shape and the proud carriage of head, the Belgian Shepherd Dog must give the impression of a robust elegance that has become the heritage of the selected representatives of a working breed. They combine the valuable qualities of the best guard dog for property with the inborn aptitude for guarding flocks. When necessary they are, without hesitation, an obstinate and ardent protector of their master. Most Belgians love water and will always accompany you for a swim. The Belgian Shepherd Dog can usually live in perfect harmony with other pets, but this is dependent on the individual dog’s nature and also how it is brought up to accept other animals. Although the Belgian Shepherd Dog has a relatively low maintenance coat they still need regular attention to enable them to look their best and feel comfortable. A good brush every couple of days when shedding or once a week when not shedding will keep matts from appearing and will make your dog feel comfortable as well as look its best. The Belgian Shepherd Dog forms strong bonds with its owner and so is more sensitive to its owner’s needs. Therefore a Belgian needs to ‘live with’ its family rather than in isolation somewhere in the grounds or left in the house alone for many hours a day. If the dog has to spend a lot of time on its own it might benefit from a companion. When investigating the purchase of a Belgian Shepherd Dog care needs to be taken to ensure that all breeding stock has been X-rayed for Hip Dysplasia and are suitable for breeding. Viewing the parents of your potential puppy is an excellent idea as it can give an idea of what your puppy may possibly develop into. It is also extremely important to socialise your puppy with people, dogs, other animals and as many different situations as possible to ensure a well-adjusted and happy pet. People who want an active and devoted companion that will return their love and be part of the family. Whether a companion for a single person or the family pet, the Belgian Shepherd Dog enjoys life to the fullest and will provide many hours of enjoyment and companionship.